On every previous hitch-hiking excursion, I had worn my army uniform but his time I wanted to carry as little as possible, so the bulky uniform was left in my wardrobe and the only baggage I carried with me was a small, Qantas, overnight bag. We left Woomera about five o'clock Friday afternoon for one of the most interesting journeys of my life. It was my first long trip in a Volkswagen and at times thought it might be my last in any vehicle. We flew down the dusty Woomera-Port Augusta road, dodging kangaroos, emus, cattle grids and pot holes; rarely were all four wheels on the ground at the same time. Perhaps the driver had always wanted to be a pilot. The road crossed the Trans Australian Railway line six or eight times and at each crossing there was a large red sign saying "STOP". The penalty for not doing so was a fine of fifty pounds, about two weeks pay. Perhaps he was colour blind or couldn't read, because whenever we approached a crossing, he considered it a challenge and rather than stop, increased speed. His theory was "the less time spent on a crossing the smaller the chance of being hit by a train." We drove all night, stopped for fuel twice and arrived at the old gold mining town of St Arnaud just before nine, he turned left; I hit the highway. Once or twice in a generation, an inspired engineer creates a truly magnificent design. In my opinion, the Supermarine Spitfire and Austin Healy 100 (both British) are two very good examples. Their shape, size and proportions are superb; a unique combination of curved and straight lines which result in a classic, ageless design, truly a joy to behold On the rare occasions when I have seen one, I dream about it for weeks and to actually touch one is an "out of this world experience." Unfortunately, the same will never be said about the Australian designed and built Lloyd Hartnett automobile. I don't wish to be cruel but to me it was an ugly, gutless, boneshaker with barely sufficient power to pull the skin off a rice pudding. If you doubt my description and wish to see one for yourself, there is a well-preserved specimen in the Brisbane Museum. As you may have already guessed, the first car that stopped was a Lloyd Hartnett and a unique motoring experience began. It was my first, and so far, only journey in that make of vehicle. With two adults on board, the gallant little four cylinder (or was it only two cylinders? ), Aussie Battler, rattled and shook its way down Victoria's Western Highway. Richard, the proud owner, was on his annual visit to his sister in Lakes Entrance and offered to make a detour to deliver me within easy walking distance of my planned destination. He said he valued the company, though I suspected he thought my presence might come in handy in case of an emergency or to beat off curious souvenir hunters. I accepted his very generous offer; it was too good to refuse. For the next five hours he enthusiastically described the virtues of his pride and joy, being careful not to mention words like reliability, economy, comfort and availability of spare parts. He did, however, indicate that in his huge three-door garage/workshop, he had two similar vehicles, just in case he needed a new engine, gearbox, differential or front suspension. When we came to even the gentlest incline, it really struggled and I felt the urge to get out and push, but down hill we really flew, sometimes reaching the breathtaking, tooth-jarring speed of forty-five miles (seventy-five kilometres) an hour. The Hartnett has never competed at Bathurst and is not one of our greatest automotive achievements. thoughtfulness, he proceeded to tell me about some of his more colourful adventures, which prompted me to write this Limerick. His amorous skills he employed. till the car was nearly destroyed. It really didn't surprise me to learn that despite being almost thirty two, owning his own home and being a permanent Public Servant, he was still single. No woman could ever hope to compete with a Lloyd Hartnett, unless of course, she was a mechanic with a passion for lost-causes or training to be one, and needed an extra challenge. But despite its various shortcomings the Lloyd was not the worst mass-produced car produced after W.W.2. 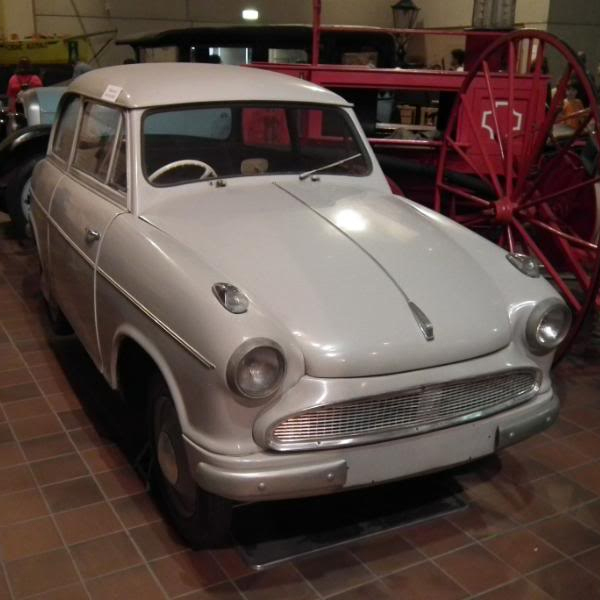 That award must go to East Germany's Trabant, which required at least three others to keep one on the road.